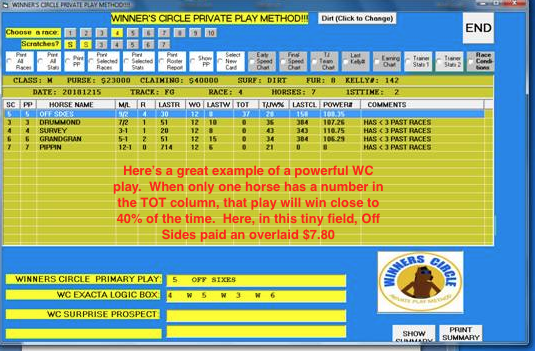 Len’s Personal Racebook Method: The WINNER’S CIRCLE Private Play Method. Super Consistent & One of the Best Exacta/Trifecta programs in Existence! And you won’t Believe the Price! 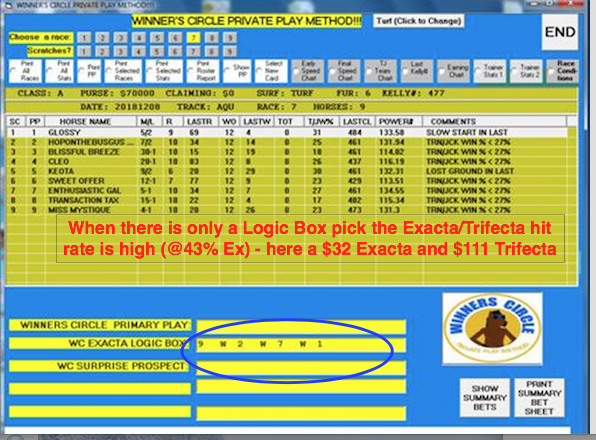 A Method Unparalleled for its Awesome Ability to Capture a High Percentage of Exactas & Trifectas! Superb on the Win & Place end as well!! Does the best thoroughbred computer programmer wager on the races himself, and if so, what is his ‘go-to’ methodology? 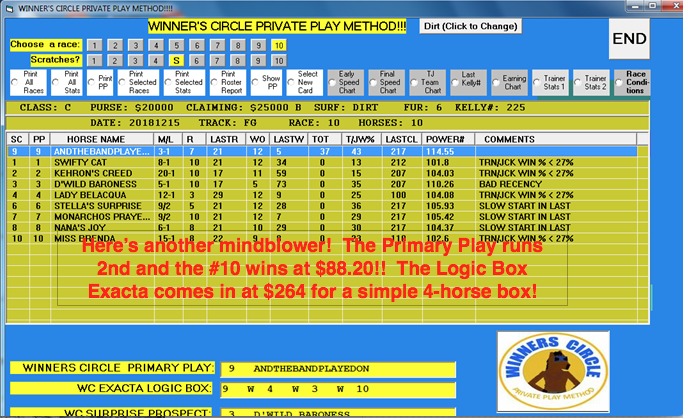 The Winner’s Circle Private Play Method! ‘To be honest, I use most of the RPM programs I have created in my handicapping. I have a program that builds a consensus of most of the programs, and base some of my play on that. ‘I have been betting for close to 45 years, and my favorite bets by far are Exactas and Trifectas. The fact is that most players still do not know how to properly play these wagers, and thus the clever fan can realize not only a high % of hits, but some very nice overlayed prices to boot. And the decision to make it public? ‘You know, I never had it formatted properly where it would be usable for the average player. ➽➽➽So here’s your chance to acquire a FANTASTIC program that will not only give you great consistency on straight bets, but allow you to cash more (MANY MORE!) Exacta and Trifecta tickets than you ever have — and that is a GUARANTEE!! And Check out the Great Price! And, of course, if you feel WC is not for you, for any reason, simply return it for a full refund. Take a look at this summary report from Santa Anita on the 5th of January. 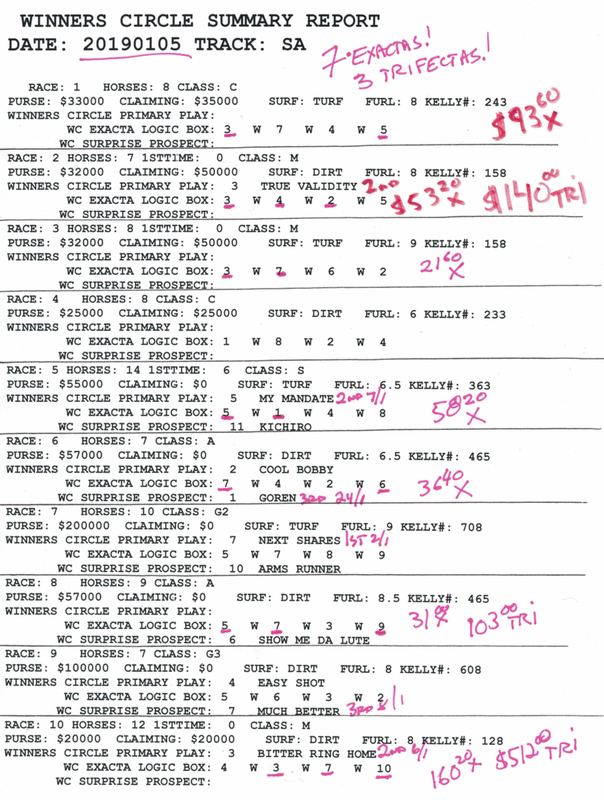 Note the EXTREME Consistency & the numerous Exacta & Trifecta Payoffs. And this is a fairly typical day! 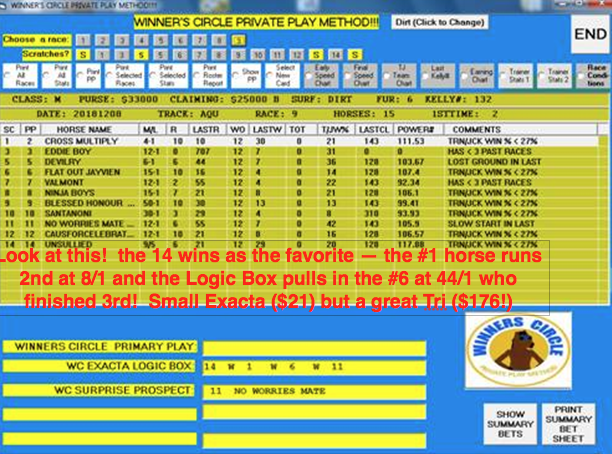 Had you simply done a $2 Exacta and Trifecta box based on the plays in the Exacta Logic Box, you would have realized a $471.00 Profit!! **Len includes a complete betting guide so you will know when to plunge and when to lay off. 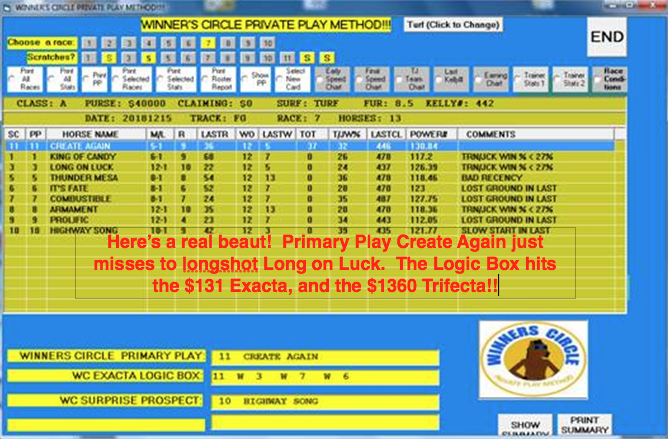 Screenshots: The Winners’ Circle Deluxe Edition Private Play Method provides you with consistent, viable plays DAILY! ☛☛And the great part is since this is a totally in-house Len Cz production, there are no commissions to pay to other authors, so while a program of this sophistication would normally be priced in the $180 – $280 range, our customers can get The Winner’s Circle Private Play Method for just $149.00! We can send you the program to download immediately, or send all the material through the mail. You will have a lot of fun with this one!